Lynne wrote to Ven. Chodron and the Abbey community about her life-changing experience at the conclusion of the 2017 Retreat from Afar on Lama Tsongkhapa Guru Yoga. She lives in Ireland. This is the first retreat of any kind that I have done and I never expected the practice would affect me so profoundly. To begin with, I was happy to do the practice in the morning, but I found the migtsema mantra very difficult. 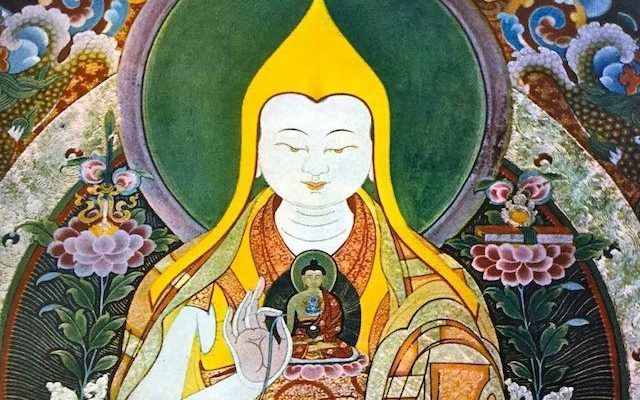 After four days though, I realized the importance of the 5 line request prayer, and I decided that I would do the Lama Tsongkhapa Guru Yoga practice with the intention to complete100,000 mantra recitations! I found so much clarity as I set about my task and had many realizations about how I was not practicing the way I should. I began to see that even after having listened to, watched and read the teachings, I was not listening properly and my knowledge was still quite superficial. I began reading Steps on the Path to Enlightenment by Geshe Lhundub Sopa. Each time I read a passage, I would find the answers to questions that were coming up; it was as though the answers were waiting for me. I actually began to feel a real joy in my practice that had been missing, because I was trying to get ahead of myself. “Yeah well, heard this before, so I am going to go onto the next thing.” I discovered that does not work. I finally realized the importance of meditating on a subject over and over again. Previously it was a chore, because I couldn’t see the point of reading, reflecting, and meditating, but now that I am engaging in these three, I get so much more from the teachings, and I feel joy that I can understand the Dharma. While doing the Lama Tsongkhapa Guru Yoga practice, I had a very profound series of experiences. When it comes to visualizing the white light and nectar flowing from the deity into the crown of my head, I felt a very tingly, cold feeling on my crown. This happened for about a week while my father-in-law was having treatment for cancer. I was doing the practice for him, and a week after the tingly experiences he got the “All clear.” You probably think I am crazy but I really feel that the Buddhas were with me when I asked for their help. These experiences strengthened my practice and my faith, and led me to contemplate why I was drawn to Buddhism. When I began my exploration of Buddhism and sought out guidance, I was advised by some Dharma groups to read certain books and my questions would be answered. Finally I came across a book on Buddhist parenting by Lama Zopa Rinpoche and laughed my head off. His teachings are so down-to-earth, and written with such a sense of humor; the wisdom expressed in that book was exactly what I needed. Through this book I discovered the FPMT website and suddenly I had found what I was looking for: sensible easy to follow guidance, people I could chat with who are on the same journey as I am and a huge sense of belonging. Eventually an FPMT student directed me to Venerable Thubten Chodron’s website; wow I just love it. Venerable Thubten Chodron is the most honest, wise, funny and joyful teacher I have ever met, and this is all tempered with a no-nonsense attitude. I took refuge in Dublin a while later, and decided that I had to have my own personal teacher. I actually got very annoyed that the teachers I asked would not teach me. So I wandered around under a cloud of “poor me,” and then the Sravasti Abbey Retreat from Afar began. After about a month, I had the most important “Aha” moment of my life: I am not that important that teachers should teach me because I want them to. I needed to have patience and a teacher would appear. A few weeks went by and suddenly I realized I have had the best teacher all along. In Geshe Sopa’s Steps of the Path to Enlightenment we are told what to look for in a teacher, the thing that stood out was that you should feel great joy when hearing your teacher teach the Dharma. This hit me like a brick in the face, I had a teacher all along who is wise and gives me great joy with her teachings, it was of course Ven. Chodron. I was so mad that I had wasted so much time thinking I had to have a special teacher, when I had one all along. This understanding then led me to another thing that I needed to resolve. When I took refuge, I had not spent any time contemplating why I wanted to take refuge or the true meaning and profundity of it. I just took it to get a Buddhist name! Since that time, I have listened to teachings on the meaning of refuge and Ven. Chodron’s Lamrim teachings. My understanding of refuge is deepening, and after the Day of Miracles I knew that I wanted to re-take refuge and take the precepts with an understanding of their meaning and why I want to keep them. I know this is a long email but I still don’t think it even conveys a quarter of the effect that this retreat has had on me. I know that the Buddhas listen to us and answer our prayers and that they are always with us; we just need to open our eyes. The Dharma holds all the answers to our questions, and we need to be willing to look at ourselves very closely and deal with the things inside we would rather not tackle, the things that make us see exactly what we are. Doing this is life changing. I am now very aware of my negative attitudes and as my children say “Mummy you don’t shout anymore!” My patience has increased. I find that the daily dramas don’t get to me now. The emergencies that occur are dealt with much more calmly. Everything in my life has changed. I have still to work on generosity, but I do give a lot more than I used to, and I find I get a bit worried when the homeless people who sell the “Big Issue” magazine aren’t standing where they usually are. The most amazing effect has been on my family. They are all changing. They are becoming more caring and will help people without being asked. We are talking about important things like why don’t people stop fighting wars? I am well on course to complete the Guru Yoga. I find myself chanting the migtsema mantra when I am getting flustered or need a moment of peace; it really is powerful. Two of my cats sit with me while I am practicing. They snuggle on their cushion next to me and just zone out and relax while I chant. I am very grateful for being able to take part in the retreat. Thank you so much for guiding me with so much love, joy, wisdom and compassion.